Playing outdoors is one of my most favorite things! 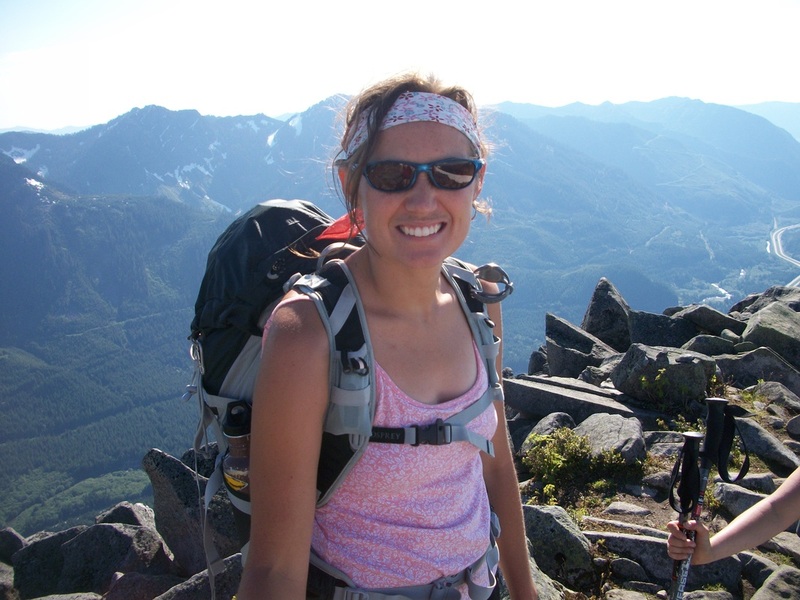 I especially enjoy backpacking and exploring in the Cascade and Rocky mountains. 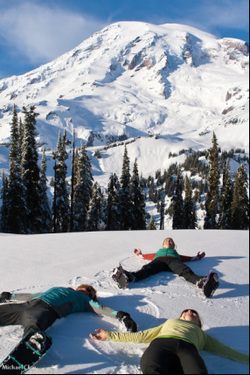 There are so many ways to exercise, get fresh air, reflect and have fun in nature. The opportunities are endless even if you live in a city. This page is designed to help make getting out into nature more of a reality. Scroll down to see all the entries under this tab, some of which include hiking and backpacking item checklists, camping/backpacking meal planning ideas, safety and outdoor/primitive cooking skills. More to come...and as always, feel free to contact me to let me know if there is other information you'd like to see included here or if you are planning a trip and have questions. To view some of my hiking photo albums, please connect with me on Facebook by clicking on the link at the top right corner of this page. 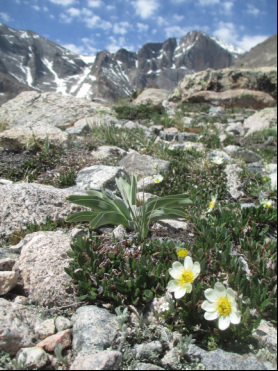 Rocky Mountain National Park is a beautiful gallery of God's handiwork. This is where try to spend time hiking as often as I can. Boulder Area Hiking Trails: this link shows which trails are currently open and closed post September 2013 floods. Scroll to the bottom to click on the map of re-opened trails. Here is the checklist I use when I decide to head out last minute for a dayhike or overnight...ussually I'm in Washinton's Cascade Mountains or Colorado's Rocky Mountains. You may want to add or subtract from this list. Especially when in the mountains, weather can change quickly and the unexpected can occur. It is always better to plan ahead and be prepared for an emergency that never happens than to wish you were in hindsight. This also allows for more freedom to have fun! Note: All clothes on these lists should be non-cotton, including undergarments for better warmth when wet or sweaty. Please be prepared to pack out all garbage and bury human waste where there are no facilities. 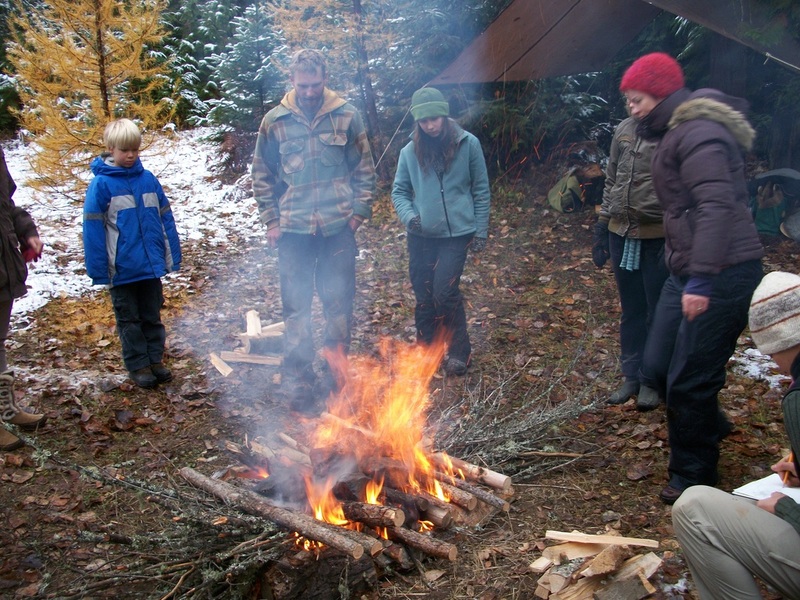 To familiarize yourself with the Leave No Trace principles click on this link. Taste--Eat what you like. Don't try and convert your taste buds to new types of food deep in the backcountry. Calories--Don't inaugurate a diet program during a multi-night hike. You'll need ample calories (and water!) to fight off fatigue and headaches. Nutrition--It's fine to tear into a candy bar during a trip, but for the long haul you want to rely on complex carbohydrates and proteins. Intelligent quick-eats such as nuts and dry fruits provide a stable flow of energy to your muscles. Weight and Bulk--Stick to lightweight and low-bulk foods as much as possible, especially on long journeys. Ease of Preparation--Unless you are an experienced gourmet, keep things simple. It's smart to be well-supplied with no-cook food items in case your stove malfunctions. Cost--Convenience has its price. Freeze-dried meals and energy foods can be expensive, but at the end of a long day when your weary body only has enough energy to boil water, such luxuries seem justifiable. Refrigeration is one of those civilized luxuries you leave behind at the trailhead. Thus fresh foods are good for 1 day inside your pack, maybe 2. Carrots can sometimes last longer. Canned foods sometimes have a place in your pack if the trip is short and your hunger for grocery store food is high. Tins of tuna or other canned meat products can be a nice toss-in item for a pot of rice, for instance. But skip foods packaged in traditional 15-ounce (or larger) cans. The weight and bulk just aren't worth it. Don't even think about toting glass bottles. Dry foods (pasta, noodles, instant rice, soup mixes, drink mixes) are light, take up minimal volume inside a pack and offer you some decent taste alternatives. Freeze-dried/dehydrated foods have improved considerably in taste, texture and appearance in recent years. They cost about the same as a meal at a modestly priced restaurant, but they won't taste quite that fresh and savory. Still, put into perspective, they deliver above-average taste sensations in far-flung places. 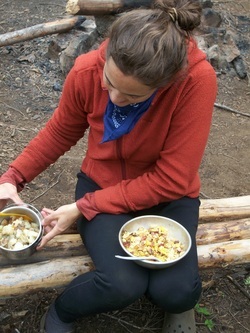 Spices can be crucial to boosting the appeal of backcountry food. Consider bringing your own spice kit, which could include pepper, garlic powder or salt, basil, cayenne pepper, lemon pepper, cumin, crushed red pepper, cinnamon or whatever else is essential to your home kitchen. Flavored beverages can taste mighty refreshing after a few days of nothing but water. Powdered drink mixes are a nice mid-trip treat. Take note that the caffeine in coffee and tea is a diuretic, which counteracts your efforts to keep yourself hydrated. 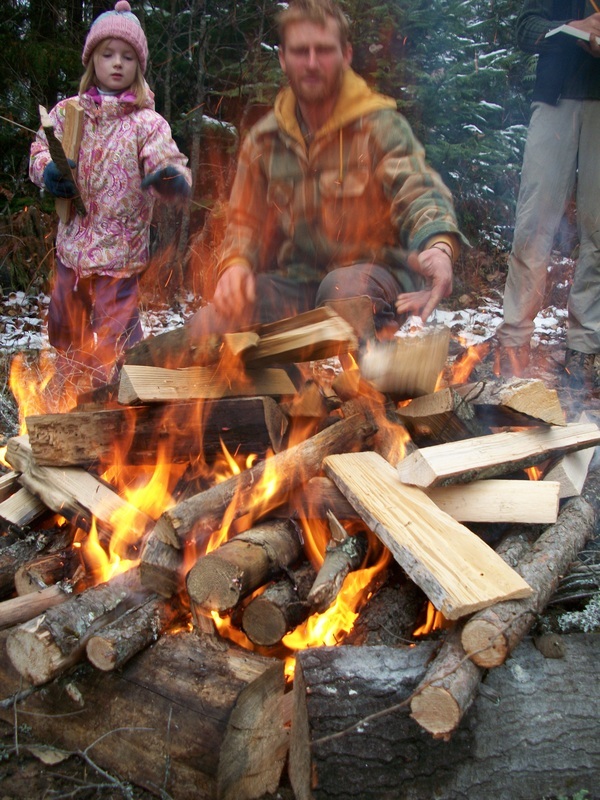 For winter camping, bring extra food to help keep your internal fires stoked and rebuff any chance of hypothermia. Carry your ready-to-eat items close to your body during the day so they are not frozen solid when you want to eat them. Backpacking breakfasts can range from something fast and basic (an energy bar) to a lavish spread involving pancakes, eggs, meats and coffee. A hot meal can give you an extra boost, true, but a quick snack means no cleanup and a quicker start to the day. Ideas: Instant hot cereals, dehydrated eggs, pancake mix, breakfast bars, granola, dry cereal, instant tea, coffee, powdered milk, juice, fresh fruit, dried fruits. Rather than take a prolonged break for a midday meal (involving unpacking, preparation, cleanup and repacking), a smarter strategy is to eat a series of modest energy-boosting snacks throughout the day. Such gradual calorie consumption is known as "grazing." 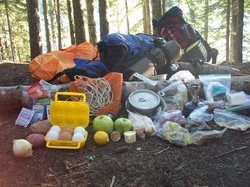 Ideas: Dried fruit, fig bars, bagels (which you can lug along on a shorter trip), energy bars, jerky and nuts. The evening meal is your reward for a full day of exhilarating exertion. If you possess elevated culinary skills that translate well into a backcountry setting, you're set for a powerful sensory treat—great food amid great scenery. If you don't mind the expense of packaged, freeze-dried or dehydrated food, the simplicity of a tasty, just-add-boiling-water meal is a relaxing treat. Ideas: Packaged meals, pasta, instant rice, ramen noodles, instant soups and sauces, instant stuffing, instant potatoes and tuna. Consider bringing along some favorite spices (onion and garlic powder, basil, oregano). One of my favorite desserts on the trail is a fruit cobbler. This works perfect if you are hiking through blueberry or huckleberry season. You may be competing with the bears but harvesting fresh berries to cook over the fire with an oatmeal topping is about one of the best tasting things I can put in my mouth after a long day on the trail. Here is a general recipe. I bring apples if no berries are in season. If you do pick your own berries, be sure you know how to identify them as edible. -sprinkle the topping on the fruit mixture. cover and cook over "low" heat as best you can. the juice from the lemon/lime and fruit should be enough to steam it and not burn it but keep an eye on it. Time will vary of course but may be around 20 minutes. Then we dug the cooking pit 2.5 feet deep, placing the dirt on a tarp that would be used to seal the pit off once the rocks, food and leaves were in. We also raked piles of leaves to layer around the food. Meanwhile at the fire, the rocks are turning red as they fall to the coals because we kept adding wood to keep the fire enveloping them...we then used a pitchfork or shovel to move the rocks into the bottom of the pit we dug. We layered with about a foot of leaves, then the cotton sack with the food we were going to cook, then another foot or so of leaves. Finally we pulled the tarp of dirt over the top. Then we waited...usually the food takes about 4-8 hours to cook if the rocks are hot enough. 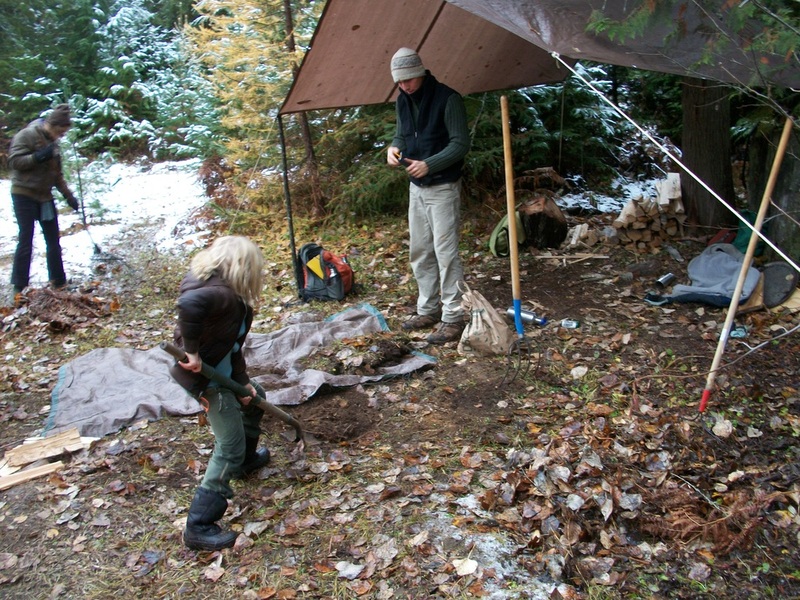 However, David had made a pit oven and had been cooking some of the food for 40 hours already...so we opened up his pit and removed the food from the sacks as smoke began bellowing out of the earth once the leaf layer had been removed. The elk and squash were delicious! 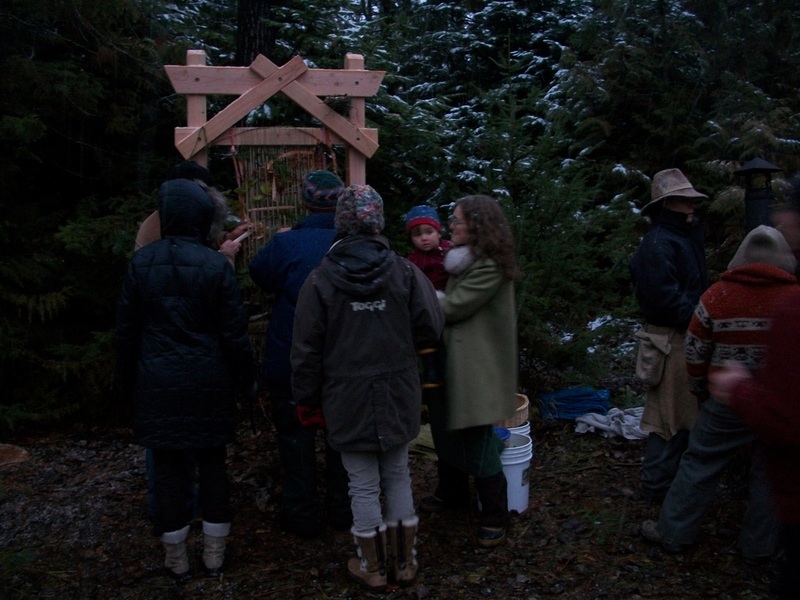 They tasted smoked with a hint of cedar and cottonwood as that was the mulch layer surrounding them as they cooked. Later that evening we dug up the rest of the food from the earlier pit and had it with a potluck dinner. This oven built into the hillside creates a draw for the air out the top, heating the rabbit stew we ate...tender and delicious! The chocolate-covered grasshoppers we ate for a good-bye treat around the fire...they were salty and crunchy.